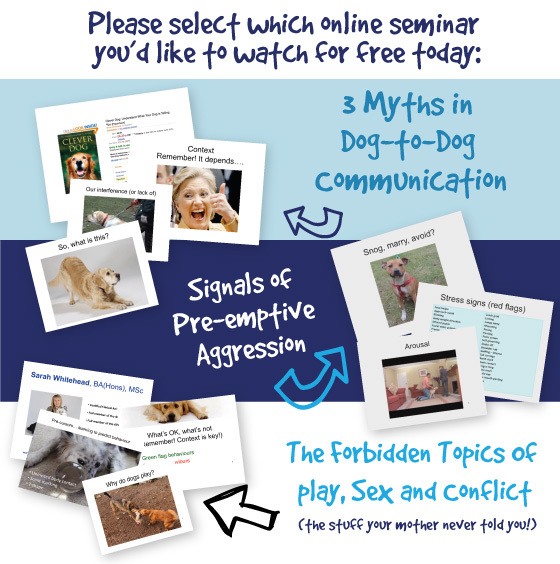 select what webinar you would like to watch. Yes, I'd like to hear about Sarah's new courses, online programmes and training and I'd like to receive invitations to lectures/events and also any fantastic offers related to canine training and behaviour. Ticky, ticky in the box if that sounds ok! Test your dog body language knowledge! 1. Look closely at this picture of a lovely Cocker Spaniel. Why do you think she is yawning? 2. Study this image of a Boxer. How do you think she is feeling? 3. Look at this picture of a Cocker Spaniel puppy. What behaviour is he showing? 4. The stunning breed of dog in this picture is a Tamaskan. In greeting the person, what is he showing? 5. Watch this video. Which emotion best describes what the dog is saying? 6. What emotion do you think this dog’s barking and body language is showing? Enter your name and email below to receive the results to your answers, as well as Sarah’s analysis of each question. Why learn dog body language? Wouldn't it be wonderful to know what your dog was thinking and feeling? Copyright © 2019 Learn to Talk Dog. All rights reserved.